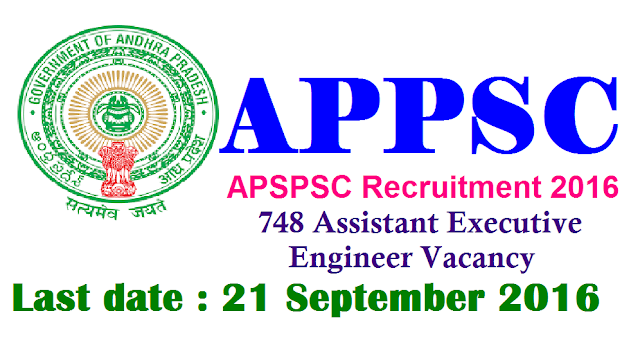 Andhra Pradesh PSC (APSPSC) invites APPLICATION for the post of 748 Assistant Executive Engineer various Engineering Services. Apply Online before 21 September 2016. Educational Qualification : Must possess a Bachelor‟s Degree in Civil/Mechanical Engineering of a UNIVERSITY IN India established or incorporated by or under a Central Act, State Act or an Institution Recognized by the University Grants Commission / AICTE or a Pass in Sections „A‟ and „B‟ of AMIE (India) Examination in Civil Engineering. The profoma Application will be available on Commission‟s Website (www.psc.ap.gov.in) from 18/08/2016 to 21/09/2016. (Note:21/09/2016 is the last date for payment of fee up- to 11:59 mid night). (Note:21/09/2016 is the last date for payment of fee up- to 11:59 mid night). How to Apply TSPSC Vacancy : Interested candidates may apply Online through the website http://www.psc.ap.gov.in/ from 18.08.2016 to 21.09.2016.